Preview Book © Get Permissions Audience: Recommended for educators, researchers, and advocates—anyone interested in understanding and serving the needs of persons with psychiatric disabilities. Valuable resource for staff development and for classroom use in courses in rehabilitation counseling, psychology, psychiatry, psychiatric nursing, and social work. An extensive collection of readings—now available only on CD-ROM—presenting current thinking, research, and practice of psychiatric rehabilitation by prominent contributors in the field. 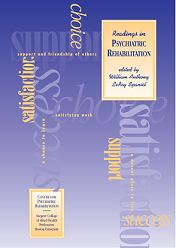 Readings in Psychiatric Rehabilitation was conceived and organized as a supplemental book of readings to further explore the concepts, philosophy, and practices presented by Anthony, Cohen, and Farkas in Psychiatric Rehabilitation. It is an excellent resource for students of psychiatric rehabilitation, professionals, consumers, and advocates—or for anyone interested in understanding the needs of persons with psychiatric disabilities. From consumer choice and consumer involvement to managed care, from CSP to ADA, from supported housing to supported employment to supported education, from PACT models to clubhouse models, from technology to a vision of recovery; this volume presents a coherent overview and synthesis of the current field of psychiatric rehabilitation. Citation: Anthony, W. A., & Spaniol, L. (Eds). (1994). Readings in psychiatric rehabilitation. Boston, MA: Boston University Center for Psychiatric Rehabilitation. Mize, T. (1995). Book review: Readings in psychiatric rehabilitation. Psychiatric Rehabilitation Journal, 19(2), 87-88.